My daughter, Goldie, turns 2 in few days. A friend of mine told me once about the continuum concept and how in some cultures, the baby’s feet never touch the ground until they’re two years old. At first, I took her words literally and I thought this sounded absurd. Well, two babies, later and I know exactly what she was talking about. It’s not that her feet have *never* touch the ground, no, that is ridiculous. But, in busy, new or crowded places, she’s always been carried by either me or my husband. When she does walk when we’re out and about, it’s for a short time. But then, she might get scared of a big dog, or get tired, or get too distracted by the flowers and the scenery. When she does, I pick her up and put her on my back again. She’ll ride in the stroller too, but I rarely feel the need to bring it. There are too many stairs and curbs and people and patches of bumpy grass to cross. As a newborn, her environment was my chest. My movements, my sounds, my smell and my touch were all things she was used to in the womb. It’s hard work being born. Learning to eat, sleep, breathe, poo, pee, digest and somehow try to make sense of the world around you. When she was new and tiny, if she got tired of trying to make sense of the world around her, she could simply bury her head in my chest (the most comfortable and familiar place in the whole entire world). If she felt like she was up for some more stimulation, she could crack open her eyes, lift her head up and look around. As she got bigger and stronger, she could hold her head up and look around for longer stretches of time and start to comprehend the sights and sounds around her. Even when she learned how to sit, crawl, walk and run, she still needed me to absorb the environment for her sometimes. When she’s in the baby carrier, I can turn my body to let her watch something, or if I can tell she doesnt’ want to see, I can turn my body away. Since her body is up against mine, I can feel when she’s excited or tired or frustrated and we can chat. When she sees someone we know, she starts to bounce up and down, throwing my whole center of gravity off! Since she’s in such close ear shot, I can hear her desperately say, “Mama, PEEEE!” and I know that I have exactly 30 seconds to get her off of my back and hold her over a bush or run to a nearby toilet so that I don’t get peed on! 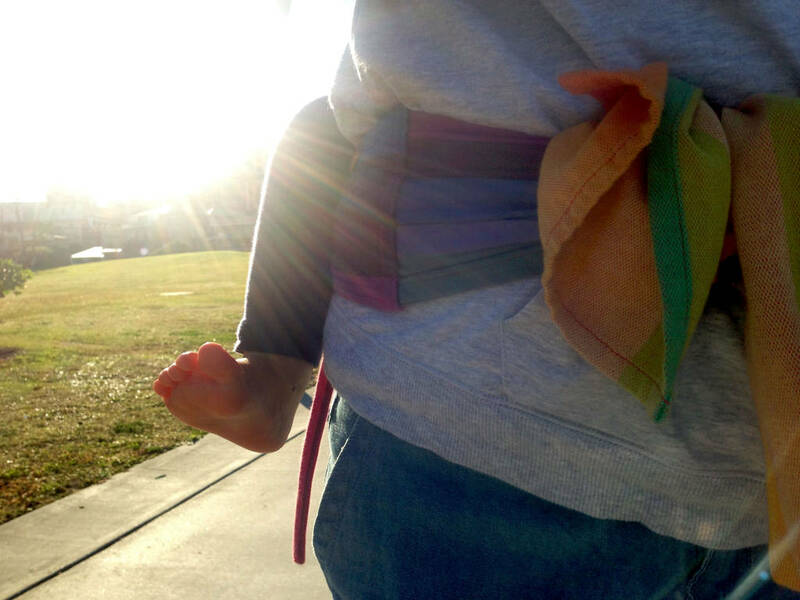 I love babywearing because it allows me to be so responsive to all of her needs and I know straight away what she wants, it’s such a powerful parenting tool. Now that she’s almost 2, she helps me pick out what wrap or which carrier she wants me to use. She tells me when she wants up and when she wants down. Sometimes she protests going in the carrier, but I tell her that she will just have to because we have to get somewhere in a semi-reasonable time frame. Am I worried that she will always be clinging to me like a monkey or that she will always need me to absorb her environment for her? Well, maybe we should ask her four and a half year old sister, whom I wore in a baby carrier exactly the same way. This morning, we were with a group of friends, and I hardly heard a single word from her in almost 2 hours, she was too busy off playing with her friends and chatting away to the other mothers. My little one, on the other hand, she stayed close. Not on me all the time anymore, but close. She likes to know I’m there, she doesn’t want to leave my side. I let her stay. I give her big mama bear cuddles and if she wants up, I rub her little feet that dangle off the side of the babycarrier. I know that she won’t be riding around on my back or my hip forever, and I know that she won’t always need me to help absorb the overstimulating things in her life. But, until that time comes (and it’s already around the corner), I’ll be there to soften the world for her. Posted in baby wearing and tagged babywearing a 2 year old, babywearing a toddler, babywearing an older baby, how old can you wear a baby for, when do babies get too big to carry, will you spoil a baby if you wear them too much. Bookmark the permalink. My thoughts exactly. Couldn’t have said it better. Yes, they certainly grow up too quickly. Now that my babywearing days are mostly over with my older daughter, I realized just how fast it really does go! Love this. My thoughts exactly, though much better expressed. Thank you! Just for the record, I almost failed high school English! haha! That’s exactly how you raise a independent, confident young person. They have to be dependant before they can become in dependant. I get the impression you also practice elimination communication?